Make room for holiday baking and cooking by cleaning and organizing your kitchen for the season ahead. These holiday kitchen cleaning tips can help you give yourself an early present this season by getting your kitchen clean, organized, and fully functional before the holidays are in full swing. When you’ve got four pots on the stove, a turkey in the oven, a ham in the microwave, and 18 hungry people in the living room – you’ll be glad your kitchen was prepared, organized, and ready for the onslaught. These kitchen cleaning tips will get organized and ready for the busy cooking and baking season ahead. First, get rid of everything you are not going to use this holiday. To be organized and sane, you need space and lots of it! Clean the empty areas and then - now this is the trick - only put back what you are going to use over the next two months. Pack up the non-holiday essentials and store them in the garage. Toss any past-their-prime foods from the fridge and freezer. Cabinets and cupboards: Replace the summer patioware in your kitchen cabinets with your holiday serving dishes and good china. Find and clean the roasting pan, bread pans, etc. Replace your everyday glasses and cups with ones that match. Drawers: Put your silver in a handy drawer. Find the holiday gadgets (basting thing, candy thermometer, meat thermometer, cheese knives, cheese holders, etc.) Tuck barbecue skewers, forks, etc. in for a nice winter nap in the attic. Pantry: Be ruthless. Is anyone really going to eat that six-month-old open bag of Oreos? Toss. What about the cans of soup no one liked? Charity bins. Have the spices been there as long as the house? Trashcan. Make room for foods that people are actually going to eat. Refrigerator and freezer: Nothing says "idk" like a dirty refrigerator. Dump everything out. Clean it from top to bottom. Toss the stuff with old expiration dates and any jellies dating back to the last decade. Make room for the goodies you're going to be cooking. Use this occasion to rethink your cabinet and drawer plan. Which cupboard is really best for the glasses? Which counter is more convenient for the coffeemaker? What drawer should the corkscrew be in? 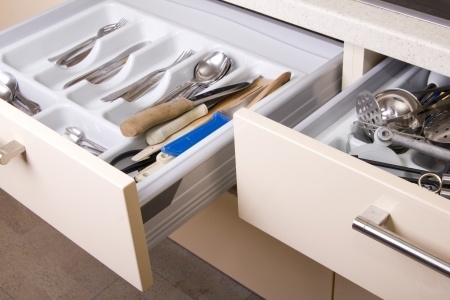 Rethink your kitchen drawer plan so that it actually is convenient for cooking. A lot of the time, we tend to leave things where we first put them, even if that spot turns out to be inconvenient. Why? Because once you move the glasses to the cup cabinet, you now have to find a new home for the cups, which displaces another item. It's a round robin effect. So take advantage of this opportunity and develop a kitchen plan that works for you. Mentally divide your kitchen into activity areas so you and your family won't be falling all over each other as you try to work. Food prep center: Keep knives, a butcher block, blenders, mixers, food processors, measuring cups and spoons here. 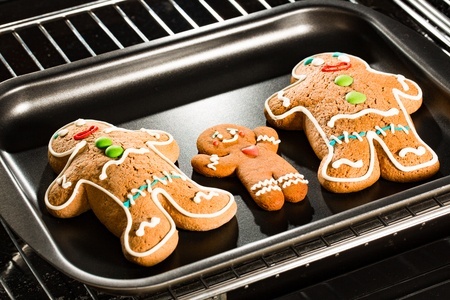 Baking center: Even those who despise cooking succumb to a little baking at Christmas time. And if you make it easy for yourself, you may do it more often. Gather your recipes, flours, yeast, baking powder, pans, cookie cutters, mixers and bread machine in one corner of the kitchen. Bring on the cookie exchange! Kid center: We want the kids to be more self sufficient - just not underfoot. Set aside a cabinet (in a far corner of the kitchen) that's just for their stuff - kiddie cups, paper plates, napkins, straws, crackers, juices. Then they can get their own snack without bothering you. Guest center: You know how people congregate in the kitchen - usually right in front of the drawer you need to get to. Create a cozy little area at the bar or kitchen table where they can sit and talk to you as you work - but stay out of the way. This can be as simple as setting up an area with various types of teabags in a pretty basket, a couple of cups, napkins, and scones - all ready to be enjoyed. Plan your main holiday meals now. Check what ingredients you have on hand; put the rest on a shopping list. Find your holiday recipes and put them in one binder in your kitchen. Find serving dishes for each entree and make sure they are clean and ready to roll. If you're hosting a holiday party or dinner party, carefully schedule the food preparation. What time do you plan to eat? Then when should the turkey go in the oven? When should the shrimp be sautéed? That way, the shrimp will be cooked on time and you won't find a forgotten tray of appetizers on top of the fridge after the last guest leaves.